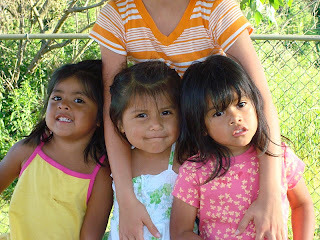 When we went to Guatemala to meet Lola for the first time, we stayed at a hotel called La Casa Grande. It was a stately old building with fountains, verandas, and a huge balcony. It was also one of the primary places for adoptive parents to stay. In fact, the hotel was filled with parents and their children. Some were visiting, some were staying with their child until the adoption was finalized, and some were on their way home with their long awaited blessing! It was a wonderful thing to have so many people there for the same reason. They knew exactly what you were going through and it was fun to swap stories and play together with the children. While we were there, we met two other families that were using our same agency and were from our area! What are the chances! In fact, two of our little ones came home on the exact same day and all three girls are very close in age. That trip started what I hope is a life long friendship for us and for the girls. We have been getting together at least once a year since we met and before the girls even came home! Last weekend we all got together for our annual get together this year. The children all bonded in an instant once again and were off and running in two seconds flat! To see how grown the girls have become and to sit and reminisce about the process we all went through and what it was like to be at La Casa Grande together is such a blessing to me. Lola loves to hear the stories of when she was a baby and it is fun for her to know that these two other girls share some of her history! I wanted to share the pictures I have of the three girls over the years together so far! They are just the most adorable little girls ever!! !